The town of Capraia is centrally located in Tuscany and it's easily reached by train or highway. 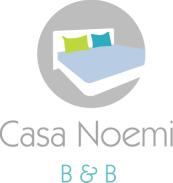 Casa Noemi is within walking distance of the train station, which brings you to the centre of Florence in 20 minutes. 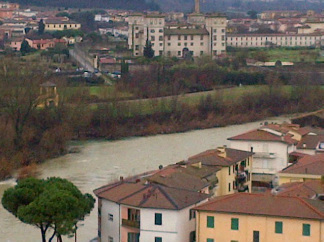 From Pisa Airport: Take the train from the airport train station to Montelupo-Capraia train station. From Florence Airport: Take the shuttle bus from the airport to Firenze SMN train station. From there take the train to Montelupo-Capraia train station. We offer complimentary pick up service from the Montelupo-Capraia train station on request. roundabout take a right, second roundabout go straight, third roundabout take a left. Go straight to the end of the street (you will see an Esso Petrol Pump), at the roundabout take a right, follow the road, keep to the left, go through the tunnel under the train tracks, then cross the River Arno. After a mile turn right up the hill (just before the bar Pitstop), direction Chiesa di S. Stefano. Take the first street on the right, towards the church Chiesa di S. Stefano. Park at the church, walk 50 meters towards the valley (with your back to the church door), take the second side street on the left, there you will find Casa Noemi facing a large square (Via Giudea 3). first roundabout go straight, at the second roundabout take a right, at the third roundabout go straight and at the fourth roundabout take a left. Go straight to the end of the street (you will see an Esso Petrol Pump), at the roundabout take a right, follow the road, keep to the left, go through the tunnel under the train tracks, then cross the River Arno. After a mile turn right up the hill (just before the bar Pitstop), direction Chiesa di S. Stefano. Take the first street on the right, towards the church Chiesa di S. Stefano. Park at the church, walk 50 meters towards the valley (with your back to the church door), take the second side street on the left, there you will find Casa Noemi facing a large square (Via Giudea 3).